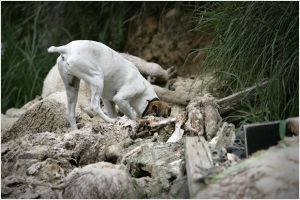 Dead stock attracts stray or unattended dogs that could scavenge on carcasses. Dispose of all dead animals as soon as practicable. Carcasses can be buried. If a pit is used, it should be covered or fenced to ensure it is dog proof. Carcasses can be burnt. If a burner is used it should be in a dog-proof enclosure as carcasses are often stockpiled before being burnt. Quick disposal of dead stock is also one of the requirements under the Ministry for Primary Industries’ Controlled Area Notice No. 294, issued to limit the spread of hydatids.